Unlike most shopping apps, SmartShop learns your personal shopping path in each store you frequent and rearranges your list according to the path you take to shop. Just walk up and down the aisles in the order you prefer and check off the items in your list in the order you pick them off the shelves. No more retracing your steps or missing items you meant to buy. SmartShop is a learning app, and you are the teacher. It's simple, really. You make your shopping list as items come to mind. When you go shopping with SmartShop the first time, just check off the items (with the touch of a fingertip) as you take them from shelf to cart. SmartShop is paying attention. The next time you shop, those items will be rearranged according to the personal shopping path you used before. After a few trips, SmartShop will have it as close to perfect as possible. As you add new items to your list and check them off, SmartShop will learn where to put them. Shopping has never been easier. Building your master shopping database may take a few trips to your favorite supermarket as you add to your master list, but it's easy and fun. 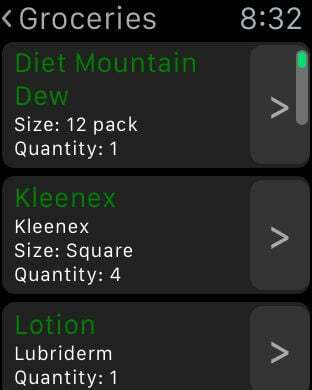 Within a few weeks, you'll be able to open your master list, edit your list by typing new items, or by simply selecting from SmartShop's suggested items. You're always only a tap away from checking items off your list. Done with your shopping? Select checkout to mark your list complete. Then, SmartShop will create a new list with any unfilled items so you're ready for your next trip. Many families have more than one person who contributes to the list. SmartShop can store your lists in the cloud using Dropbox, so every member of your family (that you authorize) is able to add to the list from their own device. SmartShop uses GPS to recognize the stores you shop in and it also knows the user, so if you like to shop from right to left but another family member does it the other way, SmartShop knows, and rearranges the list to reflect the layout of the store, and the preferences of the user. Pretty smart! Once you add an item to your personal shopping list, SmartShop will remember it. As you add new products, brands, flavors or sizes to your item list, your personal shopping database grows with you. If you choose to eliminate an item from the database, a simple swipe will do the trick. And SmartShop will let you make as many lists as you need. Cotsware, SmartShop's developer, is committed to constant improvement of their apps. So download SmartShop and put it to work for you today.